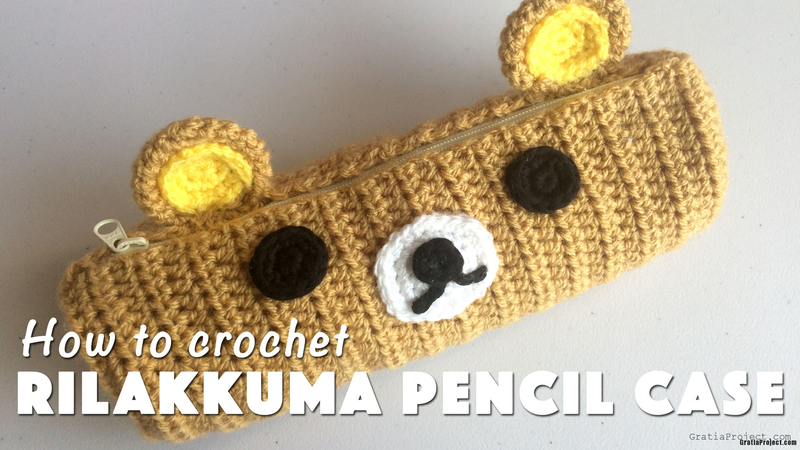 This is tutorial about how to crochet Rilakkuma pencil case. In this tutorial, I used I used Stylecraft Special DK yarn (color Camel, Citron, and White), and cotton yarn for the eyes and nose. I used 4 mm crochet hook for this kind of yarn. sc2tog: Invisible Decrease. To do Invisible Decrease, insert hook through front loop of the first stitch, then through the front loop of the next stitch (3 loops on hook). Yarn over and draw through the first two loops on the hook (2 loops on hook now). Yarn over and draw through both loops on the hook. Invisible decrease completed. Next row : Ch 2. Hdc in each stitch, in BOTH LOOP. Total 40 sts. Do not join the round. Next row : Ch 2, Turn. Hdc in each stitch. Total 40 sts. Repeat until approximately 7.5 inches. Ending with the wrong side row. With yellow yarn, make Inner Ear, use pattern above, Round 1-3. Sew or glue the Inner Ears onto the Outer Ears. Cut the yarn, leaving a tail (about 3 inches). Glue the nose tip and the shape the yarn for the mouth. Position all the Ears, Eyes, Nose & Mouth, sew or glue in place, hide leftover tails inside.